The learning curve is too steep, there is a lack of “getting started” guides. People don’t know what is possible. The data model does not provide enough storage, flexibility. Expectations for content authors (do they need to be programmers) should be determined and communicated clearly. In the future, Multi-learner training, social interaction, and Integration with IntelligentTutor Systems. should be enabled. It challenging to support both programmers and instructional designers, hit right levels of complexity and flexibility. Should we work on learning, or rather training? 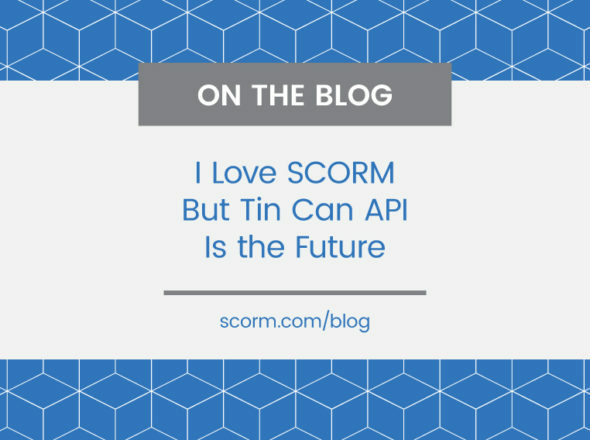 What has your experience with SCORM been? In early 2005 I was hired by a content development company to become their SCORM 2004 expert. We built the first 2004 course delivered to the Army that used real sequencing. For the next 5 years we developed course after course using pretty advanced levels of sequencing, my role was always to build the manifest file, code all the sequencing up, and develop the SCORM libraries for the company. For two years I was a principal consultant on the ADL technical team. Lately, I’ve done consulting, acting as a SCORM subject matter expert, helping with content migrations, etc. What shortcomings have you seen? The learning curve, and lack of getting started documents. There are a few content examples here and there, mainly you have to get help from someone who knows it, and then you can kind of figure it out. LMS support for the specifications. Even when you’ve figured out what you want to do is possible, and here is how to do it, it was very difficult to find a platform that actually worked. Lack of storage. Fourth edition helped, but things like an arcade style high score list, or any other social interaction kind of stuff are still not possible. We really did have a desire to store a lot more data and access it in a variety of ways. The first two items in combination really hurt adoption. And when their were’t enough people adopting it, there wasn’t enough feedback that the real technical shortcomings could be exposed, and we could never get a good feel for what people really wanted to do, because people really weren’t trying things. What did you want to do that wasn’t doable? The things we wanted to do were always doable, we know there are things you can’t do, multi-learner, social interaction. We never tried to go that far outside, as far as the standard content that you would expect to be supported, we never had a problem. Some of the things we accomplished many others thought were not doable. Many people just did not try and assumed things were not possible which in fact were probably due to lack of getting started guides, proper messaging, etc. What would you have liked to be able to do? Some discussions about building team based training, that kind of thing, but we knew the world we lived in so we designed to that. We did have some desire at one point to work with a game engine, and we understood there were challenges getting that working with SCORM. We worked with Stottler Henke on finding ways to get Intelligent Tutor Systems to connect that back to a SCORM course. Later there have been some web service projects that have taken it even further. Most of the stuff we did like that was really just curiosity, we wanted to stay on the bleeding edge of “in 5 years, what can we do”. In the work that we did SCORM was never the big obstacle. The LMS vendors were always the obstacle. Whatever happens going forward, we have to focus on when people and organizations enter the community. We need to be able to get that learning curve to a point where it’s accessible to everyone, but still be able to support complex content. That’s really the trick. The content development industry now is a challenging one because many organizations don’t treat content development like true software development. It’s handled more as authoring, with a completely different set of resources and talent pool to draw from. I think it’s hard to meet those organizations’ needs and also meet the needs of a company who views content as a traditional software development project where you have programmers, designers, a variety of resources involved. SCORM did not meet the needs of all those groups. It met our needs because we had the expertise in all the different areas and were able to deal with the complexities of large-scale SCORM deployments. When I talk to people who are the “one person shop”, a single an instructional designer trying to create training, they really never could overcome those complexities. There was expectation that tools would be available to them to realize their designs, and I think it’s not a reality to always expect that. That’s just my opinion. I think a lot of organizations and people get crippled by the lack of tools in SCORM, when really you can’t have a tool for everything. Being able to satisfy all those organizations who have such a drastic variety of needs is going to be one of the biggest challenges. How should learning happen, today and in the future? I’m no learning expert (other than the normal expertise of being human), but I think this is where we run into trouble with some of these projects. “Learning” is very abstract. I learn with everything I do, etc, etc. It’s a bit fluffy of an idea. 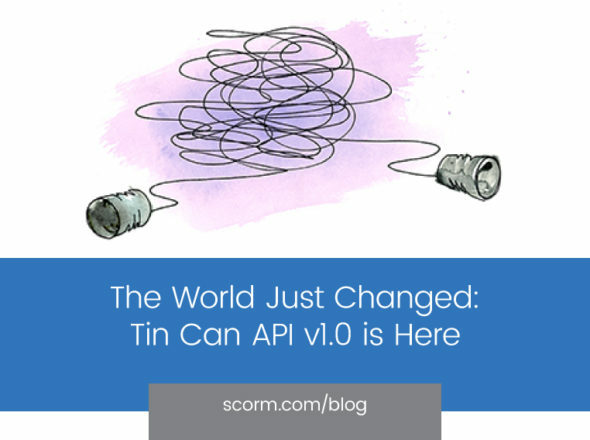 Training is more concrete and easier to build a model like SCORM around. In training, it’s more like: “Are you able to insert and IV into a patient?” — that’s easier to build training around, assess, track, sell, etc. So, how does learning happen? It happens when we place ourselves in environments and situations that we don’t have much experience in. As we “do”, “listen”, “engage” in that environment, “learning” happens. This could be at school, on the street, watching TV, etc. But I’m not sure “learning” is the problem SCORM should solve. Otherwise, we may never deliver anything. What should the next generation of e-Learning runtime communication enable? We need an extremely robust and flexible data model, even a customizable one. The more data we can gather, the more we can do with it. I think we also are a bit trapped by the way the data is compartmentalized into the scope of a SCO. I think the notion of a SCO is a valid one. But I think we have to expand to address data for a collection of SCOs. That’s where the data has context and can be quite useful. Adding some context layer may also serve well for laying the groundwork for a new sequencing. We basically need to be able to program at the “course” level as well as inside a SCO. I think the combination of those two things allows for SCO reuse, yet makes them usable in the first place in most environments.